Oil from the big spill in the Gulf of Mexico is starting to turn up in places people did not expect. That’s making it tough for cleanup crews to stay one step ahead of the oil. Shawn Allee reports some scientists hope supercomputers might help. 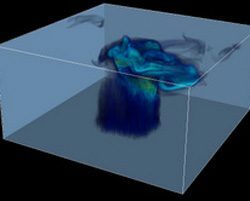 Scientists want to put together a 3D picture of what the gulf oil plume looks like, and they’re using new computer code and supercomputers to do it. The numbers are getting crunched at Argonne national laboratory outside Chicago. Pete Beckman runs the computing center there. He says satellites and water samples give us some information, but we could really use a more complete picture. Beckman says even with some of the fastest computers in the world, the model of the spill could take days to finish. 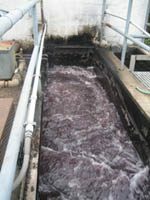 using bacteria to convert waste into hydrogen energy. on hydrogen, and it can be a careful balancing act. rest of the nation’s over 200 beverage makers and bottlers. captivity quickly adapted to their less stressful life in the hatchery. So they weren’t prepared for a cutthroat life in the wild. use of captive fish to boost wild fish populations. structure through the trees on Gibraltar Island across the bay. But they can’t go there. Recently, a few reporters got to go where usually only scientists go. the zebra mussel might be causing it. pollution, shoreline erosion, and other ecological lake issues at the lab. Cooke’s Castle. The large home was built in the 1860’s by the family of Jay Cooke. with the idea of selling war bonds and raised a billion dollars for the Union Army. soldiers were imprisoned on nearby Johnson’s Island. the science lab there today. therefore is decreasing. And that’s not the way you ought to protect the bass population. Outside, the four-story limestone turret’s crenellated top gives the appearance of a castle. The inner rotunda walls have held up surprisingly well over 140 years. Reutter wants to renovate the 15 room building into a conference center. For the Great Lakes Radio Consortium, I’m Julie Grant. An artist's rendition of the Diagnostic Center for Population and Animal Health (image courtesy of DCPAH). farmers and veterinarians get quicker answers about what’s making their animals sick. just parts of animals – a liver or a piece of muscle. died. One had swollen joints and a high temperature. The other one was anorexic. to be used in the way they are now. biological threats to animals and people. There’s been strong opposition to similar bio-defense labs in other parts of the country. So far, there’s been no sign of opposition to the Michigan State lab. Ohio, and several others are being considered in the Midwest. bigger network of labs that can quickly deal with a serious outbreak. been recent outbreaks of animal and human diseases.